A charming, pixie-dusted, good-luck charm! 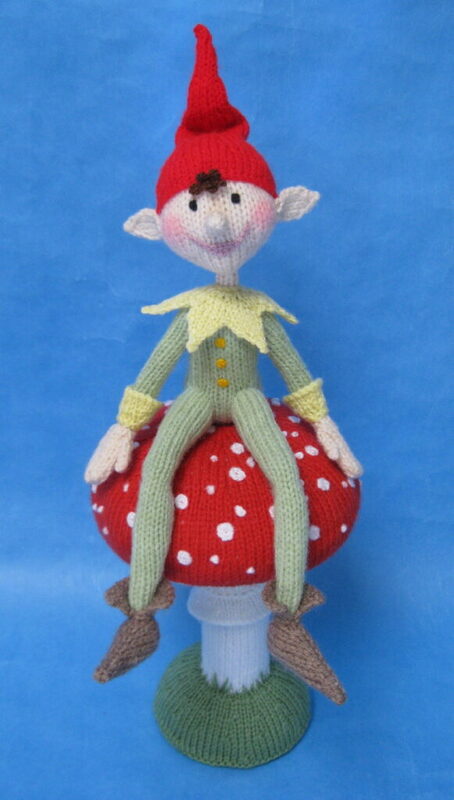 Measurements: The toadstool is 9in (23cm) tall, and the piskie is 10in (25cm) tall, without hat. You will need: Of Sirdar Snuggly DK 50g balls: 16g in Engine Red 413, 14g in Summer Lime 260, and 8g in Oatmeal 344; of Hayfield Bonus DK 100g balls: 12g each in Flesh Tone 963 and Grass 825, 8g in Walnut 927, and 6g in Primrose 957; of Hayfield Bonus Toytime DK 25g balls: 18g in White 961 and 6g in Signal Red 977; 1yd (1m) lengths of DK yarn in black, chocolate brown, dusky pink, and golden yellow; pair of 3mm (no.11) knitting needles; stitch holder; 75g of washable toy stuffing; 12in x 6in (30cm x 15cm) rectangle of polyester wadding; 10g of PVC beanbag granules; 5in (12.5cm) diameter circle of muslin; white sewing thread; stiff card; 5 plastic drinking straws; pair of compasses; long tweezers; pink pencil; clear adhesive.